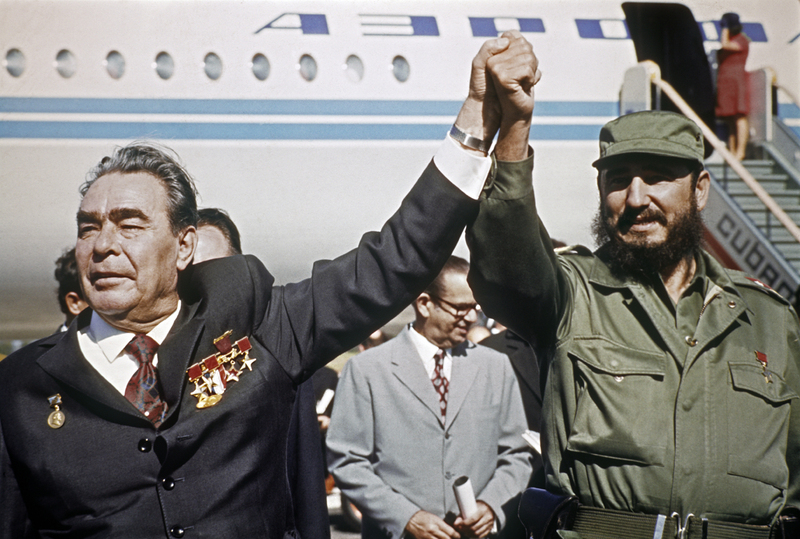 Fidel Castro (R) sees off Leonid Brezhnev, at Jose Marti International Airport after Brezhnev's visit to the Republic of Cuba. With its fiery dances, exciting music and legendary cigars and rum, Cuba under Fidel Castro was seen by Soviets as an island of freedom and joie de vivre. RBTH presents five ways this fascination with Cuba was expressed in the Soviet Union. The lyrics from the song "Cuba, My Love" became everyday phrases as soon as the song was released. This hit was written by the USSR's top songwriters — composer Alexandra Pakhmutova and lyricist Nikolai Dobronravov. The work was timed for Fidel Castro's visit to the city of Bratsk in 1962. Cuban dance rhythms and revolutionary fervor were the main associations Soviet people had with the island in the early years of Castro’s power, and these themes came through in the song. “Cuba, My Love,” was incredibly popular and it showed up on the set lists of many performers. The two most memorable recordings were by Muslim Magomaev and Iosif Kobzon. For the filming of the Ogonek New Years' program in 1962, Kobzon performed the song dressed as Fidel. Fidel Castro was handsome and charismatic, with interesting facial features and an incredible inner energy — aspects that made him an captivating figure for artists. Soviet painters created portraits of Castro during both the Khrushchev and Brezhnev eras. One of the first Russians to visit Cuba in the 1960s was the artist Petr Ossovsky, best associated with the Severe Style. Later, Ossovsky remembered how he made a sketch of Castro during lunch while the Cuban leader was talking with Soviet gymnasts. Poet Yevgeny Yevtushenko also participated in the early cultural exchanges between the Soviet Union and Cuba. After his journey to Cuba, during which he met with Castro, Yevtushenko wrote the prose-poem I am Cuba. In 1964, the poet transformed it into a screenplay and Mikhail Kalatozov made it into a film. The poem tells the stories of simple Cuban people on the eve of the Cuban Revolution. The legendary Carmen Suite is considered one of the great classic ballets and one of the most vivid productions of the second half of the 20th century. In 1967, at Plisetskaya’s request, Cuban choreographer Alberto Alonso staged a ballet to the music of Georges Bizet’s Carmen in an arrangement by Russian composer Rodion Shchedrin. At the time, the production was scandalous: For one thing, Plisetskaya stood flat on her feet, which is inacceptable for academic dance. Soviet censors were also outraged by the open sexuality with which Plisetskaya danced the role of Carmen. Compared with official Soviet cultural programs, the various Cuban dance ensembles that toured the USSR seemed like representatives of a different civilization. Cuban musicians performed syncopated melodies on their guitars and maracas while dancers in flamboyant costumes uninhibitedly swayed their hips on stage. Soviet audiences were enthralled. Young people were inspired to take lessons in Cuban dance rather than gymnastics, for example. This fascination with Cuban culture lasted for decades.